Children pose for pictures with Mickey and Minnie Mouse at a subway station in Shenzhen as part of a promotion by Hong Kong Disneyland Resort on Nov. 15, 2015. Winners could get tickets to the Hong Kong park. Hong Kong Disneyland Resort has recorded its first annual loss since 2011. Its latest financial report shows it fell HK$148 million (US$19 million) into the red for the fiscal year ending October last year. Revenue also fell 6.4 percent to HK$5.11 billion, the park's first year-on-year decline in income since 2009. It made a profit of HK$332 million in 2014. Andrew Kam, its managing director, blamed the figures on increased costs and growing competition from other destinations. "Tourists now have more choices, because many countries have relaxed their visa requirements," he said. "Currency rates in some countries have depreciated remarkably over the past two years and airlines are offering more international routes at competitive prices." 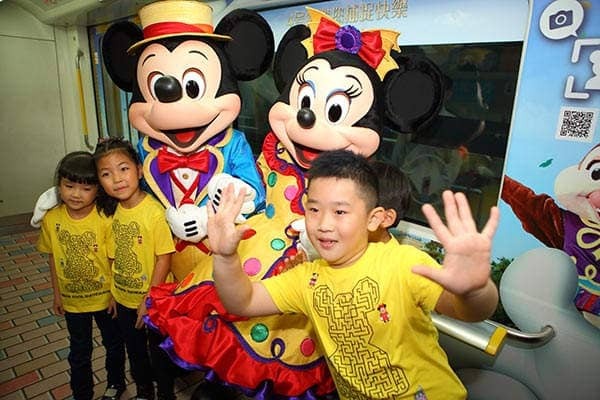 Hong Kong Disneyland's total attendances fell to 6.8 million in the year, a 9.3 percent fall, while the figures also revealed a dramatic 23 percent drop in numbers from the mainland, which now accounts for 41 percent of total visitors compared with a half during its peak. Kam admitted it had been "a challenging year", but said the company had already adopted a new strategy to attract a more diverse mix of guests, particularly from Asian markets including India, Thailand, Singapore, and Indonesia. Officials from Hong Kong Disneyland attended 16 major expos in the Asian markets over the past year to promote the site, he said. There has also been a concerned social-media campaign, including one using Facebook in the Philippines, which has attracted about 400,000 followers. In the mainland, Kam said its marketing focus will be cities and areas linked by high speed rail, after the opening of the Guangzhou-Shenzhen-Hong Kong express line in the future. The number of local Hong Kong visitors to the site actually set a record in 2015, accounting for 39 percent of the total, a 14 percent increase on the previous year. But Kam admitted the city is a relatively small market and expected the figure to remain stable this year. As for competition from the new Shanghai Disney Resort, which is due to open this summer, Kam said the Hong Kong park will continue to launch new attractions to lure visitors. In 2016, he said, it is opening new features based on the blockbuster movies "Star Wars" and "Iron Man", as well as a resort hotel. The site also plans to launch a three-day discount ticket to compete with Shanghai Disney.